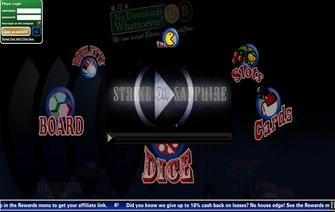 Strike Sapphire is a Bitcoin only casino who has been around since July 2011. Whilst that may not seem a great deal of time compared to some of the bigger branded casinos, in terms of the world of Bitcoin, it’s makes them one of the granddads of the industry. They have attempted to re-create that complete casino feel with the inclusion of a wide variety of games to choose from. Whilst many Bitcoin operators choose to go down the route of simply picking one game for their site and sticking to that, it’s always interesting to see how these fully loaded casinos will compare. This isn’t just in the world of Bitcoin either, but also to see if they can rival some of the bigger players in the market. Due to the –Bitcoin – market still being very up and coming, it’s important to take into account that these sorts of casinos aren’t going to have the initial funding behind them to employ a huge range of designers and create a massive team to boot. But it’s surprising how far a limited budget can go and there are already a few competitors in the Bitcoin sector that have managed to produce worthy alternatives to the branded casinos. Interestingly, Strike Sapphire is one of very few in the world to not only be powered by a games producer, but also for that games producer to own and run the company as well. New users to the Strike Sapphire casino can claim up to 100% of their initial deposit in the form of a bonus. There are no limits on the amount in which you can claim but the maximum in which you deposit at any one time is $1,000. You must then wager through your deposit and bonus combined 30 times before being able to withdraw and any withdrawal made before that time will void the remaining bonus on the account. Secondly you can also claim a cash back bonus of 18% on every bet you lose! There are two parameters in which you will become eligible for cashback. The first is that your account gets to less than 10c before you can claim any cashback amount. You need to calculate your play through multiplier which can be done by adding your deposit amount to your previous cashback amount before then dividing that number by the total amount you have wagered in that time. The next part is the player points multiplier which simply goes up as you earn more points for playing at the tables. Depending on your points total will depend on your percentage of cashback you can claim. Straight away we were impressed by the number of games at the Strike Sapphire casino. They are broken down into six categories of Video, Slots, Cards, Dice, Board and Roulette. Now we realize some of these are standalone games of their own, such as roulette, but categories such as cards include games like blackjack, poker, 3-card and rummy, whilst slots include N-Slots, 60 Watt Slots and Mayan Gold. The games which are branded will likely be new to most who aren’t familiar with the site or indeed the software, and that’s because they are all designed and registered to Strike Sapphire. Admittedly it is a bit of a shame to not see some of the better known branded games, but we can see that this company are doing their up most to try and stand out from the crowd and go their own route within the industry. What we did like about the games is the fact that they are all available within a window format meaning you can open up a browser inside another to play multiple games at once. In fact, we would go as far as saying that Strike Sapphire are the only Bitcoin casino to offer this function, which sits them ahead of the field already. When into the games you can select the game type, whether to play for real or play money, stakes and then the maximum number of players at the table – typically. Now for some games the edit-ability of these options will be limited; so for instance blackjack, there is only one variation so you can’t scroll through a host of options for that game. But when it comes to poker you get a whole host and even a lobby to view current games that are running. Sapphire Poker has many game options available with variations including Texas Holdem, Mississippi Seven, Omaha and 7 Card Stud, along with pot limit, no limit, and limit variations of each. Strike Sapphire poker is one of the most popular game options available and even allow guest around the world to receive rakeback and other perks. We think Strike Sapphire happens to offer some of the fairest and finest bitcoin poker available. Probably the best part of the games has to be the fact that so many can be changed and set up as you like. Taking the slots for our example you can switch between the amount of pay lines, the number of characters and even the weight in pay-outs for each combination. It’s also possible to switch to basic or advanced views to allow you to see the frequency of each picture in each position. Some of the slots even include progressive jackpots, but in all honesty this pretty much shows how limited the traffic on Strike Sapphire is due to the insanely low numbers of offer for a progressive. The site runs in dollars for ease, but obviously you need to make all your transactions via Bitcoin. 1 Bitcoin equates roughly to $100 in money eligible at the casino with the maximum deposit amount being just shy of 10 Bitcoin a week. Please not that any deposit made greater than the maximum they allow cannot be returned, so make sure you check on the site first. If you have any queries or are still unsure please contact their support staff first. While deposits were pretty much instant after getting the addresses from the site, withdrawals were also in a timely manner although took a little longer. Withdrawals up to 450 take about 1-2 hours to hit your Bitcoin wallet whereas withdrawals of $50 or more are made in a batch each day at 3pm GMT. Any conversions that are made from or two Bitcoins will be made via the going rate on MtGox.com at the time of process. The support staffs on hand at Strike Sapphire were pleasantly coherent and intuitive. You can connect them via email, phone and even Skype (generally for verification purposes) which is a really solid number of ways to get in touch with the customer service team. We’ve already mentioned a fair few features on offer at Stroke Sapphire casino such as the windowed screens and range of games on offer. What accompanies these perfectly s the inclusion of an ever increasing games portfolio. We are reliably informed that for the first few months of trading the company started off with just handful of games and since then have managed to build up their portfolio. As the company that own Strike Sapphire also create their own products, it’s no mean feat to see over 20 games with each have a ton of different variations to keep things fresh. Probably the only downside to the whole site has to be in the aesthetics department. And to be honest, this might be us being overly critical, but we live in an age where we are now used to shiny, smooth, slick, clean and generally just dam good looking games, and unfortunately, these just don’t compare. This isn’t a criticism, as such, more of an observation and it just feels as if the games look fairly dated to be honest. On the flip side of that the reduced amount of resources needed to run the games mean they operate super smooth and we’ve never had any issues with glitches or crashing whilst playing, which has to be the most important factor really. The guys over at Strike Sapphire casino can be really proud with the progress they have made to their site. The wide variety of game and features has made it a real joy to use. The longevity of the site is definitely something that’s going to work in their favor with it being refreshing to see someone take on the whole casino role with Bitcoins, rather than just the odd one or two games. It’s a site that’s already been able to compete over the last few years and we think if they continue to progress as they have, then they will be challenging with some of the bigger casinos in the Bitcoin gambling industry very soon. Bonus Create a free account and take advantage of Strike Sapphire's Casino welcome bonus, 100% up to a maximum of $1,000!